This recipe is to celebrate summer squash and my beautiful CSA bounty. There’s something about the brightness and warmth of summer squash that is so inviting. It welcomes you with a smile and shines “this is freshness!” A new Meatless Monday favorite, it’s packed with nutrition and flavor. For dinner we enjoy it warm, right off the stove, for lunch, chilled or at room temperature. Possibly my favorite thing about this dish is that it’s a one pot meal. Lately I find myself overwhelmed with details. Toasted this, or a sauce of that. Weekday dinners should be simple, easy and low on dish washing responsibilities. While the lentils cook, you chop your veggies. 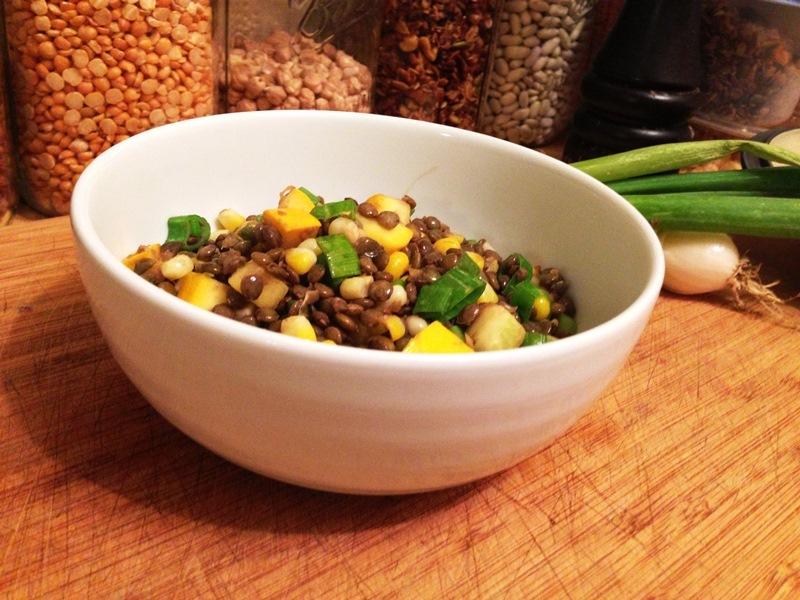 Drain the lentils and leave them in the colander while you sauté your squash and vegetables. Mix it all together, season and enjoy. In a small dutch oven (3.5 quarts) bring lentils and water to a boil. Reduce heat to an almost simmer and cook until tender, 20-30 minutes. 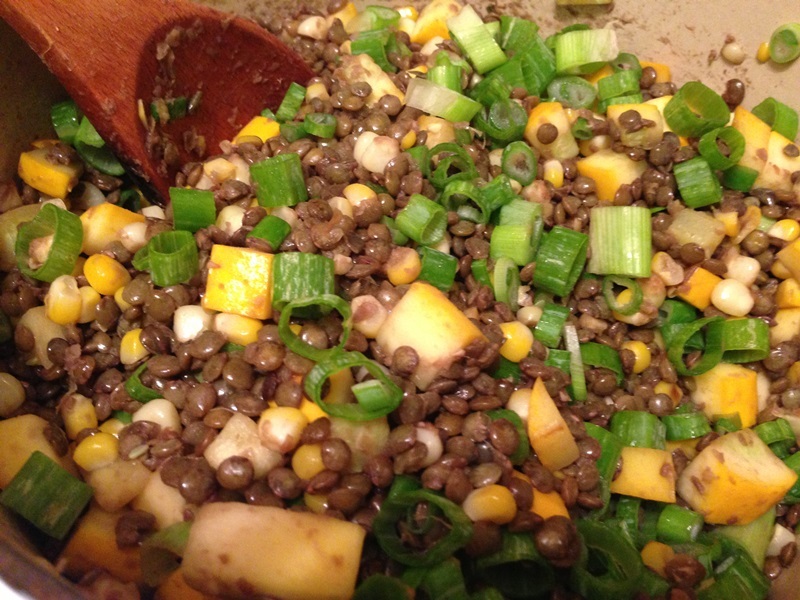 Drain lentils and set aside. In the same dutch oven heat olive oil over medium heat. 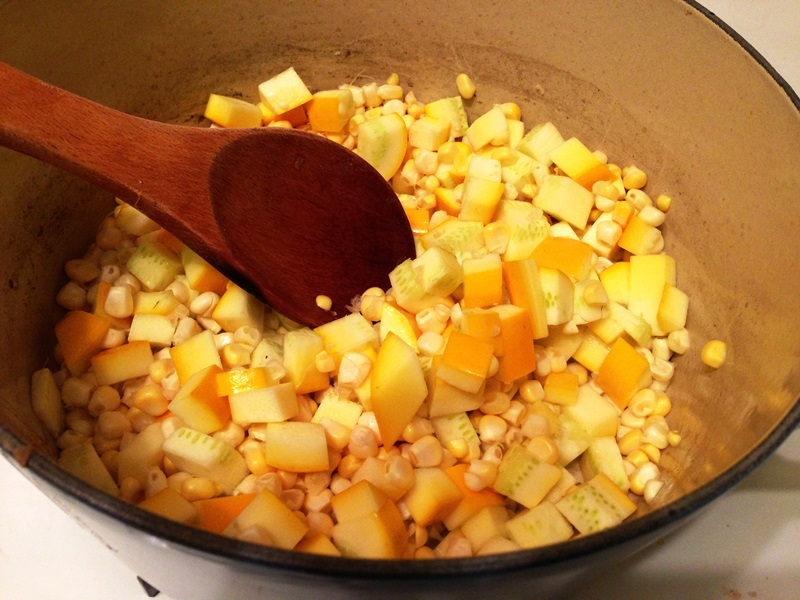 Add squash, corn and a generous pinch of salt and sauté until tender. Stir in lentils, continuing to cook over low heat until dish is evenly warmed. Remove from heat, stir in scallions and balsamic vinegar. Season with additional salt if desired and serve. Sounds and looks wonderful. I don’t get spaghetti squash either. Thanks, Carla! I think I first tried spaghetti squash when I was trying to be “healthy” and low carb. I’m sorry, but if I want spaghetti, there’s no substitute. Haha, great minds think alike! I’ll look for the recipe Friday. Love the combination of the lentils and squash and corn. Sounds really delicious! Thanks Suzanne. The bread pudding also got better with age, more vanilla-y. We had the last of it last night and had to finish off the cream too so it was pretty much swimming in a pool of it. I think the cream was my favorite part! Thanks Christy! When someone says they dislike squash I’m like wait you dislike all squash? You don’t like zucchini, and some people don’t even put it together that zucchini and butternut squash are part of the same family. No shame. I would live on sliced mozzarella and heirloom tomatoes if I could! I never really go out of my way thinking I want to make a squash recipe, but then I get to the market and they all look so gorgeous. I end up going home with a few pounds and then have to figure what to do with them.